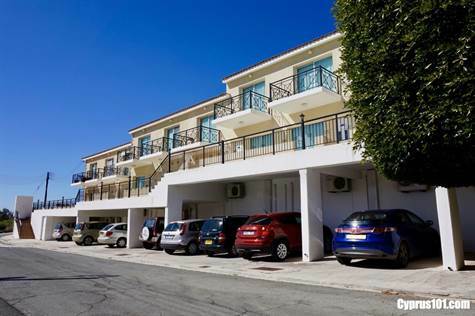 Townhouse for sale in Peyia, Paphos – This spacious 2 bedroom, 2 bathroom townhouse is situated on a small development within easy walking distance to the village amenities of Peyia. Coral Bay, known for it’s sandy beaches and crystal clear waters, is only a 5 minute drive away. The property benefits from stunning sea views and includes many extras such as air conditioning, ceiling fans, double glazing, fly screens and much more. The ground floor accommodation features an open plan living area with comfortable lounge, dining space and end kitchen. The kitchen with granite worktops and breakfast bar includes a fridge/freezer, built-in oven, electric hob, extractor fan and microwave and there is provision for both a dishwasher and washing machine. From the kitchen there is access to a rear patio and sliding patio doors in the lounge provide easy access to a tiled veranda with amazing coastal views. Upstairs are two double size bedrooms, both with fitted wardrobes and en-suite facilities. The front bedroom benefits from a private balcony from where the amazing views and sunsets can also be enjoyed. The rear bedroom has direct access to an outdoor veranda. The well maintained communal swimming pool with terrific views, sunbathing terrace and shower facilities is situated to the side of the project. Covered parking is located at the entrance to the project. This townhopuse for sale in Peyia is ideal as a permanent residence or holiday home, comes part furnished and has full title deeds.